Stay up-to-date with all of ECE's editorials and publications. Ms. Erickson was invited to speak at the North American Society for Trenchless Technology (NASTT)’s 2015 No-Dig Conference in Denver, Colorado. The No-Dig Show is the largest trenchless technology conference in North America, where hundreds of professionals attend to learn new methods and techniques that will save money and improve infrastructure. Beachgoers can expect to see barges, tugboats and other equipment off the coast of Siesta Public Beach for the next month as the county installs a discharge pipe beneath the sea floor. The work is part of the $4.5 million Beach Road Drainage Project expected to be completed in December 2013. The project should alleviate flooding of the beach and nearby roadways that often occurs during the rainy season. Workers are drilling for the pipe that will be buried 40 feet below the dunes, beach and seabed. The pipe, which will be connected to an expanded stromwater retention pond at the public beach, will release the water 2,000 feet into the ocean. “We’re really on the leading edge of technology. Nobody’s built one of these before” – Naples Mayor John Sorey. A 3.3-acre manmade island soon may be taking shape in Naples Bay. Sarasota residents have learned that a state rule change creates a new opportunity for the county to try and reopen Midnight Pass. Along the spit of sand once known as Midnight Pass, time stopped when the channel was bulldozed closed 25 years ago. All efforts to reopen the channel have failed, while time has created a new ecosystem in Little Sarasota Bay that environmentalists say should be left alone. But, for good or ill, the Midnight Pass clock is about to start ticking again. This week, Sarasota County will begin sending a final package of scientific data, argument s and commitment s to the Florida Department of Environmental Protection. Midnight Pass will stay open this time because of a 260,000-square-foot sand trap designed to capture sand pushed in during storms, and because of a uniquely shaped inlet that will keep the water flowing. At least, that is the plan. The $15 million project to reopen Midnight Pass and restore dozens of acres of sea grass and mangroves is either beautiful in its array of interlocking pieces or doomed to failure by its complexity. For 25 frustrating years, "Open Midnight Pass" has been a passionate slogan of boaters and residents and a top political issue, yet nothing happened. On Wednesday, though, members of this patient group were pinching themselves as they realized their long effort might actually be nearing success. Despite some doubts they can succeed where twice before they failed, the County Commission voted Tuesday to seek the environmental permits needed to reopen Midnight Pass. A coastal engineer who successfully relocated an inlet in North Carolina readies her proposal to restore the much-contested passage to Little Sarasota Bay. 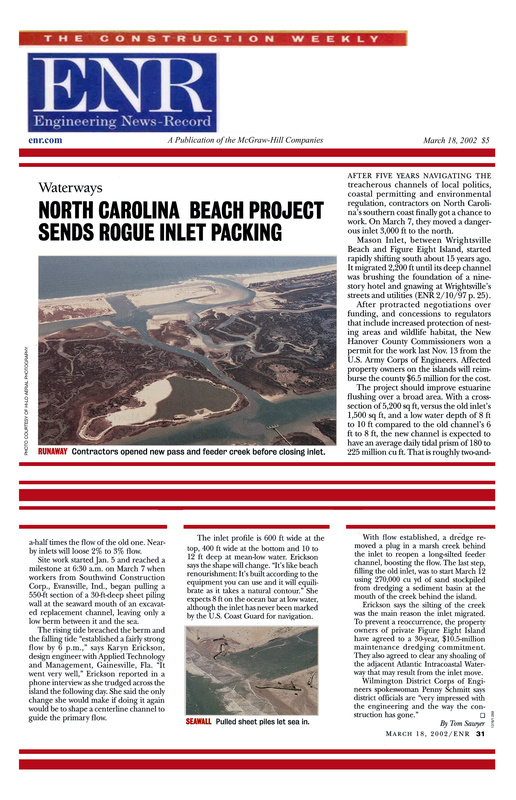 After five years navigating the treacherous channels of local politics, coastal permitting and evironmental regulation, contractor on North Carolina's southern coast finally got a chance to work. On March 7, they moved a dangerous inlet 3,000 ft to the north.